This guide was written by long-time community member CAnon! He's contributed so much to the community, from his cool customs in our custom character tournaments to general memery! He's also, of course, a Lixis player. Lixis tends to do well against opponents who rely heavily on specific Bases to cover weaknesses in their attacks, such as people with little hit confirm on their styles, such as Eustace. She can also disrupt momentum fighters who rely heavily on ante bonuses, such as Shekhtur, via judicious use of Naturalizing. Conversely she has difficulties against enemies with enough movement, or “dodge at Range X” effects, to prevent her from consistently hitting. This can often be from Ranger-archetypes keeping her from hovering at close-to-mid Range, like Tatsumi easily can. She also struggles against opponents with highly disruptive effects on their Styles or Unique Ability, such as Sagas. 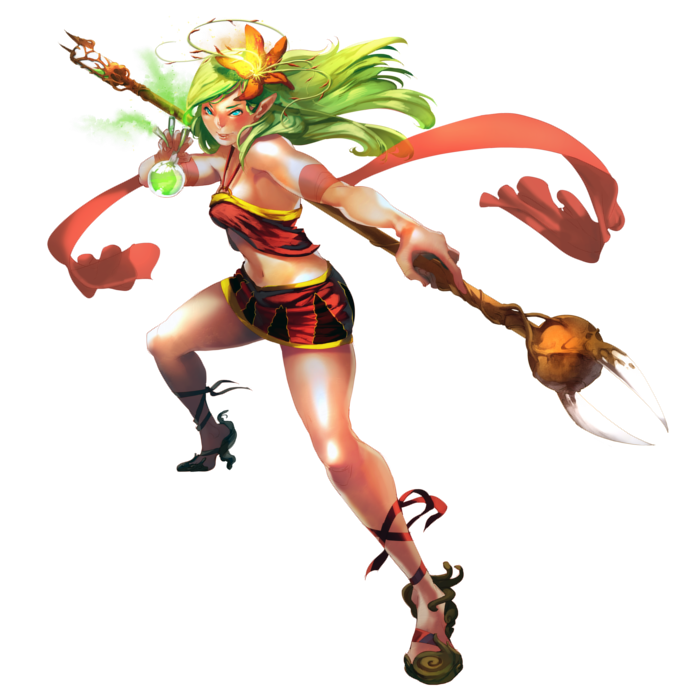 Lixis is a control-based Counter-attacker, who uses her unique ability to severely limit her opponent's options via a barrage of consistent hits. Keeping the momentum on her side by debilitating foes in this manner, this toxic dryad applies crushing pressure to snowball her way to victory. Range 2-3 is your sweet spot. You can fight competently at 1-4, but 2-3 is where you have access to as many of your attacks as possible while negating many of the average opponent's. This is why hugging center-board, and space 4 in particular, is so important – it keeps you in or near your ideal range, and effectively removes the opponent's Burst from the equation. Particularly at the start of the duel, feel free to intentionally trade down on the first couple of beats as long as it allows you to trade. As Lixis, you gain pressure just by hitting the opponent – regardless of whether it’s for 7 damage or 0. Provided you don’t allow too large a life lead to form, doing weak or slow but consistent and safe attacks can help establish the card-lock you need to win. Dodge is bad, but not unplayable: With so much focus on nullifying the enemy’s Dodge to maintain the card-lock, you’d be forgiven for thinking you never want to Dodge for similar reasons – and generally, yes, you don’t want to Dodge as Lixis. However, always keep perspective. If they do this huge attack you can’t beat, will you be able to hit back? Will you be stunned? Even if you weren't, is the life-lead now near-irredeemable? Remember that, once every blue moon, you do want to Dodge, even if it relieves pressure. Pressure can be regained, life cannot. Lixis, whilst by no means a Generalist, has reasonable to good matchups against most of the cast. As a result, if you already have an answer to fast opponents who can ignore defences and don’t already have a pair of counter-attackers, you can pretty comfortably stick Lixis in most compositions to provide a bit more durability and control. Moreover, due to her relative strength and how frankly frustrating playing against a Lixis can be, she can serve well as ban bait also. Lixis’s Unique Ability is Withering Touch. It effectively adds the trigger “On Hit: The opponent must discard a base of their choice from their hand with their current attack pair” to all of her attacks. Whilst it is incredibly simple, it is deceptively oppressive. Bases being a full half of an opponent’s attack means that depriving them of additional Bases very rapidly exposes key weaknesses that can be exploited via knowledge of the Base Pentagon (If you are unfamiliar with the concept, I strongly recommend this article, as good Base management is an important skill for all characters, but especially Lixis). To use an example: say your opponent only has Grasp, Drive and Shot left in hand and you are at Range 1, with no effects on their Styles or UA relevant to preventing your attack. You, provided you have a Style with at least +0~1 Range, can make an “unbeatable” play with Strike. Grasp will no longer counter you as it will be unable to push you out of range, so you will win the trade 4-2. Drive will be unable to advance out of your range, and so at best trades 4-3 in your favour. Shot runs the risk of being out sped and simply stunned outright. Because their only viable counters to the attack, Dodge and Burst, are in the discards, you can engineer situations where you guarantee you win trades (even if sometimes only by 1 or 2 life) and, more importantly, you hit – keeping the pressure up for the next beat. Obviously, the pay-out is even sweeter if, on the rare beats Lixis goes “fast”, you manage to out speed and stun them before any retaliation can occur. By fighting in this manner, applying immense pressure and forcing continual “no-win” situations, Lixis can gain exceptional momentum and snowball her way to victory, one beat at a time. Just ensure nothing breaks your hit-chain, or else they may get the breather they need to turn the tables. Lixis’s Unique Base is Lance. It’s quick as Grasp, with an average 3 power, and the range is... a little awkward. Yet, it is literally the single best thing about Lixis. Looking at her Unique Ability, a doubt may be forming in your mind: “But isn’t there a normal Base, which everyone has access to, which makes you miss? Can’t they just Dodge literally every 3rd beat to waste 33% of my attacks and ensure another one of their Bases is in hand at all times?”. Lance is the answer to that. It has the passive effect of “Opponents cannot move into the spaces adjacent to you”; meaning it not only stops many Drives in their tracks, it also prevents them from using Dodge. This is due to the fact they cannot move into Range 1 of you, and even if they were already there they must instead retreat as an attempt to advance past you is an attempt to move into a space adjacent to you – which is an illegal move due to the passive effect – and as there is no option to not move, they must retreat. Lance is therefore an absolute necessity if you intend to hit every single beat (which you certainly should). It becomes exceptionally oppressive if you are able to feel out when your opponent may be about to dodge – or if you manoeuvre them into a position where they have little choice but to do so. As Lance is so vital to Lixis, I’ll mention how it may work with each of her Styles. Venomous is a pretty great style. A bit of optional mobility (acting as effective range), a small power boost, and even a touch of Stun Guard despite having no priority penalty. Beyond that, the On Hit effect slows the opponent for the next beat, helping ensure you can near-guarantee a hit. It’s a nice style especially for Beat 1, allowing you to quickly start moving onto or just beyond space 4. For attack pairs, it goes very well with Drive (using Force Gauge Stun Guard if appropriate) to help reposition to your preferred spot, or with Shot, to make a safe long-range attack. Venomous also works well with Lance, as the optional move gives it a reasonable range 2-3, it gets a good amount of power, and it doesn’t impede on Lance’s naturally great Priority. Vine is Lixis’s anti-Ranger style. However, it can just as easily be used at mid-range to keep punishing the opponent. Vine has a wide range, average power, and slow priority. However it gains a respectable Stun Guard 3 and the ability to pull your opponent up to two spaces On Hit. It can therefore help reposition if you find yourself wildly out of place. It works great on space 4 with Strike, when their Dodge is down, as it has solid trading potential and effective full-board range. Additionally, you can use the pull effect to setup for next beat – such as pulling an adjacent opponent past you to Range 2, so you can Lance them later. However, if you just find yourself on near-opposite ends of the board – a very bad game-state for Lixis – you can pair it with Drive or even Shot to help salvage the situation, confident in your range and defence to weather their blow and hit back. Lance can work with Vine, thanks to its high defence and good range, though it leaves you with an average, easily clashable priority, and is a bit of a waste. It is a solid pair, and may be situationally necessary, but it does mean you are losing two good tools at once. Pruning seems questionable statistically – low power and awful priority with zero defence seems bad enough, and the very little range bonus you get seems a mean deal. However, it has incredible effects, and as such is arguably Lixis’s best style. Firstly it has a Reveal of +1 Power and Priority per base in the nearest opponent's discards – this means it is actually (contrary to the printed stats) always at least at average priority and a small power boost, which only improves as you further cardlock your opponent. With the maximum 4 Bases in their discards, you effectively have +3 power and +2 priority – which is undeniably huge and allows for massive, tempo-shifting pay-out attacks. Even better, it has an On Hit effect which forces the opponent to discard a second Base of their choice – meaning that if they already had 4 Bases in their discards, they will only have the two Bases from their Discard Two in their hand on the following beat. If you can consistently hit with Pruning, you can prevent them from carrying any extra Bases over from beat-to-beat – meaning you can effectively soft-lock them into losing pairs, at least until they gain access to their finisher. Just beat in mind the bonii are all from the effect, so anything which forces you down to printed values will make one sad dryad. Pruning pairs well with Drive, which makes great use of the bonus range, power and priority. From further distances, Shot can also be viable as it will likely out speed anything your opponent can throw at you at that range, and potentially even stun out any chance of a retaliatory attack. However, in my opinion, the best use of Pruning by far is Pruning Lance, which I would suggest can even be considered Lixis’s signature move. Lance’s high base speed makes it very difficult to clash, let alone out speed, once it has the Pruning reveal added. The potential power 6 pay-out covers every space excluding those adjacent to space 4 when she has her preferred positioning, and her opponents cannot even move into those spaces to evade the attack. Moreover, thanks to the Lance passive, you know the pay-out from Pruning isn’t able to be juked by a well-timed Dodge. Rooted is an interesting style. 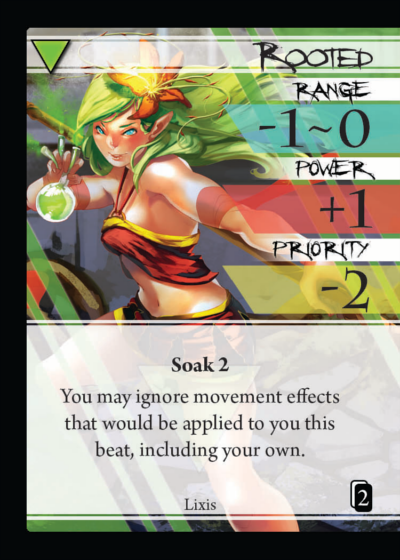 Soak 2 and a small power bonus helps it out in trading and makes up for the low speed, but it’s the range and passive effect which really stand out. Rooted has -1~0 Range, and a passive effect allowing you to choose to ignore movement effects targeting yourself. So, for instance, you can choose not to advance with Drive, if you realize on Reveal that you would simply be moving yourself into a bad trade. Rooted Burst is a really fun pair. Decent defense (with Force Gauge Stun Guard), range 1~3, and the Start of Beat option to Retreat up to 2 makes it a great, somewhat evasive, pair from space 4. Rooted Strike lacks range, but does have niche applications. If you can corner them (so their Burst no longer works) when their Dodge is down, you can effectively guarantee a win beat – as Strike’s only other counter, Grasp, will no longer be able to push you out of range, unless you allow it. Rooted Lance works much in the same way as Rooted Strike – but with better range and priority, at the expense of a lot of defense and a point of power. It’s also the only Lance which hits adjacent opponents, so that’s another thing worth considering. Naturalizing is the “Disruption” Style on a highly disruptive fighter. A bit of range (a recurring theme with Lixis), a small power malus and priority bonus is straightforward enough. Nonetheless it’s Reveal effect can be staggeringly powerful. It, in essence, negates anything the opponent may spend at ante, and prevents them from improving range, power and priority beyond their printed values by any means. In specific match-ups, this can be devastating. As mentioned earlier in the article, if someone like Shekhtur were to expend multiple tokens and some Force Gauge for priority it will be shattering for that investment to be completely nullified by Naturalizing. Therefore, she will likely play more conservatively for fear of wasting her resources – which is often an equally acceptable result for Lixis. Even against opponents without anything to ante in their kit, you can still use it to get unopposed Force Gauge Priority boosts – making it effectively a +3 priority Style. Exploiting this synergy with Force Gauge Priority, Naturalizing Shot becomes a fast, very long range attack which may not do much damage but nonetheless activates your UA to setup for the next beat. Expanding on that idea, Naturalizing Grasp can be a solid play to very quickly move them away from you whilst doing a cheeky 1 damage also. Naturalizing Lance is respectable for it’s 2-3 range, high relative priority, and undodgeable nature. However, the low power means if you end up trading you will almost certainly come out worse for wear. Additionally, the better potential uses for both Naturalizing and for Lance give it a high opportunity cost – often relegating this pair to a very small niche. Due to its lack of maximum range and defences, Lixis’s own Styles somewhat out-shine Swiitch, meaning you will likely have it sitting dead in hand most (if not all) game. Virulent Miasma has good range, power and priority. It makes the opponent lose life each ante step, and causes them to instead take a huge priority malus if they are unable to lose life due to already being on 1 life. This can not only “poison” your opponent, sapping their health until they are too feeble to endure, but also increases the odds of you hitting first to chip off that final health point. However, it can take a long time to reach that point – time you may not have, if you have already entered Finisher range health. Life Virus has similar stats – though it is anti-ranger in terms of its range band, it’s a bit slower and with quite a lot of added defence. It too has a life loss effect, though its own nominates an opponent’s Style and Base – for each time either are played, they lose a chunk of life. Play both simultaneously, and lose lots of life. It’s useful to deter the opponent from using specific cards you dislike, and can strip them of life much faster than Miasma, but the lack of a penalty (beyond being on 1 life) at 1 life may make it the weaker side.